Christy Barritt is a prolific author of suspense. She both self-publishes and writes with Love Inspired Suspense. 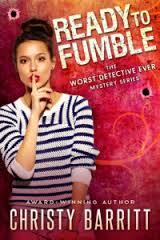 And she has a new series out titled "The Worst Detective Ever". Something about those words snagged my interest...and made me laugh. So I picked up the first book in the series. Here's a small blurb, and we'll chat on the other side! Joey Darling, better known to the world as Raven Remington, detective extraordinaire, is trying to separate herself from her invincible alter ego. She played the spunky character for five years on the hit TV show Relentless, which catapulted her to fame and into the role of Hollywood’s sweetheart. When her marriage falls apart, her finances dwindle to nothing, and her father disappears, Joey finds herself on the Outer Banks of North Carolina, trying to piece her life back together away from the limelight. A woman finds Raven—er, Joey—and insists on hiring her fictional counterpart to find a missing boyfriend. When someone begins staging crime scenes to match an episode of Relentless, Joey has no choice but to get involved. Joey’s bumbling sleuthing abilities have her butting heads with Detective Jackson Sullivan and kindling sparks with thrill-seeking neighbor Zane Oakley. Can Joey channel her inner Raven and unearth whodunit before she ends up totally done in? And where is her father anyway? Can she handle fame or is disappearing into obscurity the wiser option? Much like Barritt's "Squeaky Clean Mysteries" series, this new one is written in first person and with plenty of wit. Christy Barritt has mastered her tagline of "Quirky mysteries and spine-tingling suspense". And here in one of her quirky mysteries there are still plenty of suspenseful moments, but none that have you reaching to flip the lights back on. With Ready to Fumble we're introduced to a new character, Joey Darling. She's strong and smart, and I like that about her. I also like that she has a sense of humor and is a very unlikely detective. Like other Barritt books, a love triangle is set up in this book. Here's the only thread I struggled with. I won't lie, I'm not in love with the character of Zane. I do like that he's very different from Jackson, but at times I felt Zane bordered a caricature of a surfer-boy and seemed too young for Joey. I missed what drew her to him, and that made the third angle of the love-triangle lacking for me. That being said, the mystery moved at a very good pace and the remaining characters were a joy to meet. I looked forward to the second book coming out, which did this week! I happily give Ready to Fumble 4 out of 5 stars and you can purchase it here.